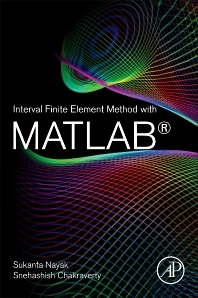 Interval Finite Element Method with MATLAB provides a thorough introduction to an effective way of investigating problems involving uncertainty using computational modeling. The well-known and versatile Finite Element Method (FEM) is combined with the concept of interval uncertainties to develop the Interval Finite Element Method (IFEM). An interval or stochastic environment in parameters and variables is used in place of crisp ones to make the governing equations interval, thereby allowing modeling of the problem. The concept of interval uncertainties is systematically explained. Several examples are explored with IFEM using MATLAB on topics like spring mass, bar, truss and frame. Dr. S Nayak’s research interests include Numerical Analysis, Linear Algebra, Fuzzy Finite Element Method, Fuzzy Heat and Neutron Diffusion Equations, Fuzzy Stochastic Differential Equations and Wavelet Analysis. He has co-authored one book to date, several book chapters and numerous articles in academic journals.